For the first time in years, the Philadelphia Flyers have a prospect pool that boasts of solid players at all positions. The Flyers have a group of top tier defense prospects along with an underrated group of young forwards and goalies who are playing around the world. Players like Ivan Provorov, Nicolas Aube-Kubel, Travis Sanheim, Shayne Gostisbehere, and Travis Konecny will dominate the headlines this season, and rightfully so. They are all prospects who will put up dazzling numbers, and if they do not produce, questions will be raised. Below the prospects is a group of decent prospects with limited offensive upside. Players like Taylor Leier, Sam Morin, Robert Hagg, and Oskar Lindblom could each develop an offensive game, but they may not capture the imagination the way the top tier of prospects will. Finally, the Flyers now have a slew of prospects that are relative unknowns. However, for three such Flyers prospects, the early returns in 2015-16 have been very impressive. When the 104th overall pick came around at the 2015 NHL Draft, there were still a few players on the board whose names I recognized. When the Flyers picked Vorobyov with that pick, I was instantly stunned. Why not pick Filip Ahl, Conor Garland, or Dmytro Timashov? They had each put up big point totals the year before. But alas, the Flyers went with the big Russian center. Vorobyov was described as a “good playmaker” and a “responsible as a player in all zones” after the draft. Most scouting reports spoke highly of Vorobyov’s ability to shut down the opponent, with little thought to his offensive abilities. Playing in the MHL, the junior league of the KHL, Vorobyov earned 20 points (8G, 12A) through 39 games in 2014-15. Not exactly dazzling numbers. When one puts in perspective the fact that players like Vladimir Tarasenko, Valeri Nichushkin, and Nikita Kucherov were either playing in the KHL or averaging nearly a point per game in the MHL during their draft year, it was easy to see why the offensive side of Vorobyov’s game was not highly touted. However, he burst out of the gates in 2015-16 with a three assist performance in the MHL season opener. He then went through an eight game lull, only earning one assist. In his last few games Vorobyov has found his offensive touch, earning 11 points (3G, 8A). He now has 15 points (3G, 12A) through 12 games. So what can we continue to look forward to in Vorobyov’s game? First, it is obvious that he needs to gain some consistency. Going long stretches without points, and then having multi-point games is not a recipe for long-term success. Second, he needs to continue improving on face-offs. Last season, Vorobyov won 56.4% of his face-offs in the MHL. Through 12 games, he has only won 49.3%. If he wants to become a middle-six NHL center someday, he will need to show the same dominance in the face-off circle that he had last year. Lastly, we should hope/expect to see Vorobyov called up to the KHL at some point this season. If he continues to produce at the level that he has over the last few games, it will quickly become apparent that he is too good for the MHL. Ultimately, Vorobyov is still a few years away from the NHL. But seeing a “defensive” center put up points the way he has is definitely encouraging. Philippe Myers was eligible to be drafted in June at the 2015 NHL Draft. He ended up being passed over, but he clearly caught the eye of scouts in the Philadelphia Flyers organization. 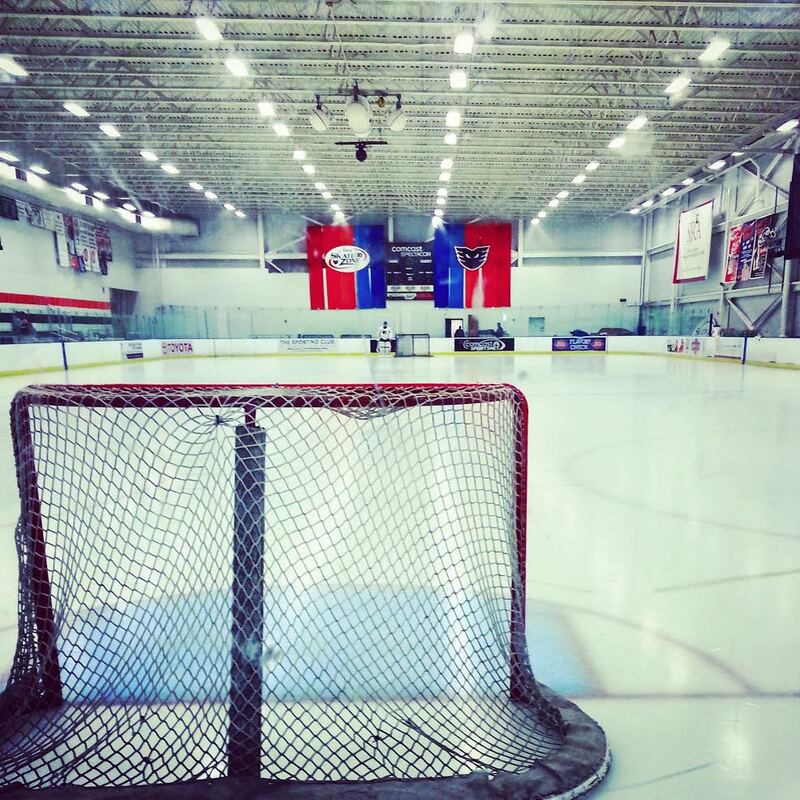 The Flyers invited the large, right-handed defenseman to training camp. Then, to much surprise, the Flyers signed Myers to an entry-level contract on September 21. The Flyers sent Myers back to the QMJHL shortly thereafter. Prior to signing with the Flyers, Myers had 12 points through 108 QMJHL games. Although points are not everything that counts toward the evaluation of a player, especially a defensemen, it is difficult for a defenseman with virtually no production at the junior level to be a successful NHLer. Even “shut-down” defensemen like Braydon Coburn and Dan Girardi put up decent points at the junior level. However, upon his return to juniors Myers has put any questions about his production to bed (for the time being at least, it is still early). In seven games since returning to the QMJHL, Myers has three goals and four assists. He is averaging a point per game since his return and nearly a point per game for the season. It is a long season. A lot can change between now and April, but the early returns are good for Myers. 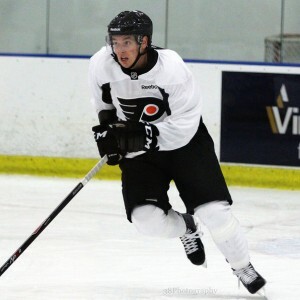 He could still spend the rest of this year and next year in the QMJHL, and he may even need some AHL seasoning, but the Flyers look to have made a smart investment into an undrafted player. The Flyers drafted this “atypical” Russian in the sixth round of the 2014 NHL draft. The organization praised Fazleev’s play without the puck and his attention to detail in all three zones. Both in his draft year and last year Fazleev put up modest numbers. He averaged .65 points per game in 2013-14 (25pts in 38 games) and .72 points per game last season (51pts in 71 games). He did not drastically improve from 2013-14 to 2014-15 like many prospects do. 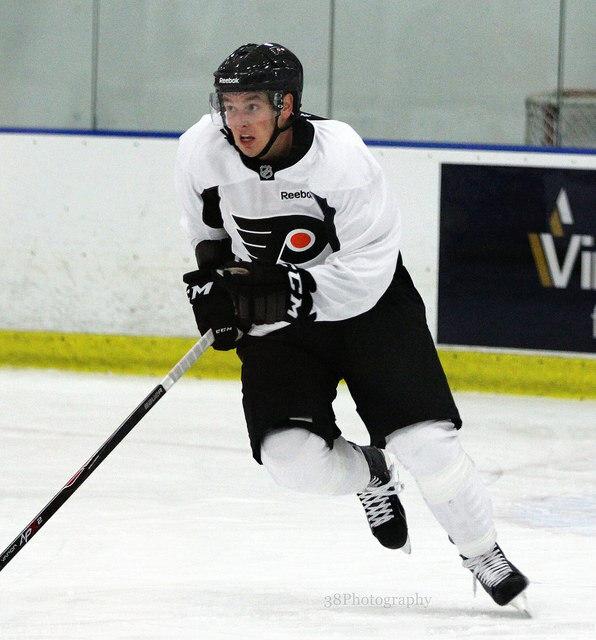 However, Fazleev’s tenacity and work ethic earned him an entry-level contract last season. This year, Fazleev has gotten off to an impressive start. He has four goals and four assists through the first six games of the season. Of his four goals, two have been scored short-handed. We know that Fazleev is never going to bring down the house with his offensive skill set. But if he can prove that he is a valuable penalty killer, a hard working defensive player, and someone who is still able to chip in some offense, then Fazleev likely has a bright future in the NHL.